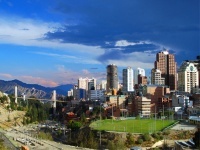 Sitting two and a half miles (4km) above sea level, La Paz is the world's highest capital. Visitors will encounter a city of enthralling contradictions, where efficient airlifts and shimmering hotel facades are as much a part of the experience as diesel engines and ramshackle brickwork. Illimani, the most well-known of Bolivia's lofty peaks, rises in the background. Fruit sellers, trinket vendors, dapper businessmen, alpaca wool weavers and brightly dressed Andean women bring a distinct vibrancy to the city, making it a wonderful destination for people-watching. Tourists can also expect interesting museums, and modern hotels. Regarding shopping, paintings, handcrafted silver jewellery and beautiful alpaca wool products are among the many items on offer. Thrill-seekers may enjoy the Death Road Mountain Bike tour, which involves a two-hour trip from the city.